JEFFERYS - The Coast of West Florida and Louisiana..
JEFFERYS,T. - The Coast of West Florida and Louisiana.. The Coast of West Florida and Louisiana.. - JEFFERYS,T. Size : 18.7 x 24.7 inches. / 47.6 x 62.7 cm. Description :Rare and important chart of Louisiana. Jeffery's was one of the most prolific and important English map publishers of the 18th century. His earliest known work was a plan of London & Westminster 1732. 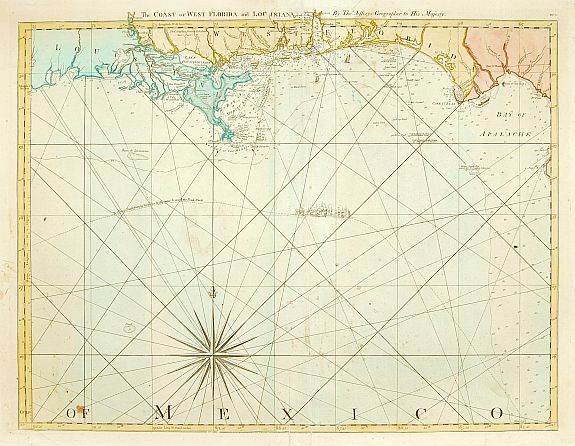 Between 1751 and 1768 he produced important maps on America, West-America and the West Indies. From one of the most important atlases of the American Revolutionary War period. Printed and Sold by R. Sayer and J. Bennett, Map and Print Sellers, No. 53, Fleet-Street. Condition : Repair of split lower part centre fold 1cm into engraved area. Some minor discolouration of paper and small brown spotting lower left.